i'm gonna do my best to save this tree . Most Copper products (except cuprous oxide or copper octanoate) become excessively toxic if mixed with very acidic products, such as elemental Sulfur or phosphoric acid. I haven't heard of injecting plant trunks with phosphoric acid, which is quite different from phosphorous acid. Phosphorous acid products can be sprayed on trunks with a penetrant adjuvant. Was this freezing weather or simply “cold”? What temperature did it get to ? (please indicate Celsius or Fahrenheit). It was cold weather and the temperature got to 0 to 2 Celsius with strong dry wind . Well 0C with dry wind would be enough to cause that damage. How often was the tree being watered? Insufficient before and after a weather event like that. Should have been watered heavily. How often it should be watered ? i didnt want to give it more water becuase of the flowers . but unfortunately half the flowers were burnt by cold wind . i see this mango variety very senstive to cold . unlike keitt or other varieties . Har, would you recommend using Peter’s liquid stem for foliar feeding and occasional drenching with an 1:100 injector? It appears to contain all the metals you have mentioned above, thanks. I assume that Peters mix would work, if used at a very low rate when spraying on open blooms. Try it just on a branch or two, and watch it for 10 days--- if no harm is visible, then spray the rest. I suspect that the amount of Iron is rather higher than needed, when compared to the other ingredients. I hadn't heard of a predatory stinkbug! Did you get another picture of the back of the predator? From that angle it looks like a beetle. Now if I could only get some of them in my yard! These weevils are eating everything up. They are usually just on my peach but they have now started taking a liking to my mango trees new growth! Wow! And that stretched "radiation symbol" on the back should be easy to remember! A couple of my Pim Seng Mun seedlings have this happening to some of their leaf stems. It's not superficial like sooty mold, but is in the tissue. What is it and what can I do about it? Thanks! Could a metal-handled tool, on a hot day, been leaned against the tree? Do you think it's some sort of burn? The seedlings aren't that big, so haven't had to support any tools yet! I'd be happy if it was just a burn as opposed to some sort of bacterial or fungal infection. Would it be wise to spray with copper or sulphur or cut and throw away those particular leaves, as a precaution? That is not Mango Malformation disease. That is a pretty typical flowering panicle in Winter for SoCal grown Mangos. You can just leave the blooms or cut off 1/2-2/3 just to take some weight off the branch. I believe that is a fungus. I have seen that in a lot of trees in SoCal, looks like you guys have it in Florida too. Sometimes you can see a hole where the darkening begins. It usually starts on that little stem where the leaf begins, just like the picture you posted. In our colder climate, the darkening progressively moves down the central vein of that leaf and the leaf eventually dries up, sometimes staying attached to the branch after it’s dead. 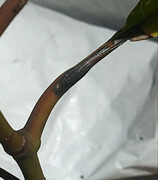 Sometimes, dieback of the stem occurs around areas that show these symptoms. I would spray with Copper fungicide recommended for mango and alternating it with Sulfur per manufacturers instructions. If you use a systemic copper like Magnabon CS2005, it will work better than some of the cheaper coppers. I am relieved to see your diagnosis, I was ready to yank the tree to save the rest. One thing though, CC is the only tree with deformed or dwarf flower panicles, rest have normal looking long panicles. Thanks.